Our priority at Pat's Hot Tubs & Pools is making sure the customer receives the best value for their money. We offer quality products at reasonable prices and we sell chemicals, maintenance products and all the accessories for pools and spas. We install and sell above ground pools and LaZboy spas/hot tubs along with liners for in-ground and above ground pools. If we don't have it at Pat's Hot Tubs and Pools, we will do our best to get it for you. We do weekly cleanings and maintenance for pools and spas/hot tubs or we will teach you what you need to do for maintenance. 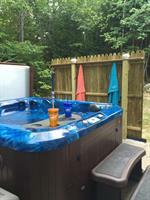 We want your pool and hot tub/spa ownership to be safe, simple and fun. We offer a M2M discount of 10% off any purchase over $20 which cannot be combined with any other discounts or offer.